When international students travel to the United States to learn English, the language barrier is just one of their challenges. Cultural differences like being overwhelmed in the grocery store, being embarrassed about not tipping a server (there is no tipping in China) or learning where to get help in serious situations are a few of the struggles they encounter. 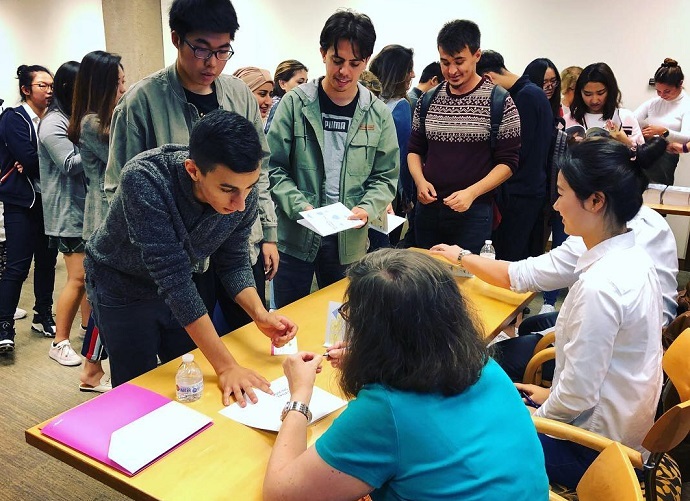 During the 2017-18 academic year, students from Japan, China, Norway, South Korea, Taiwan and Saudi Arabia were able to put their experiences and feelings on paper. 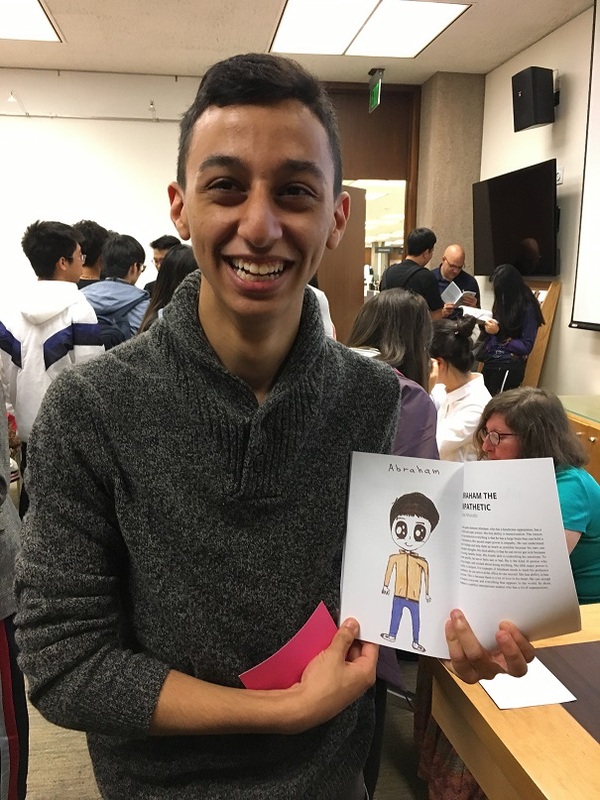 As part of a writing project, the students were given autobiographical and creative writing prompts that encouraged them to reflect on what it means to travel abroad to improve their English language proficiency. Bandar Alhoraibi from Saudi Arabia has his book, “Becoming International,” signed at book signing. Walker adds that once the project was underway, unexpected positive outcomes started to appear for both the students and the teachers. Huan-Chen Tseng from Taiwan wrote about his feelings of isolation when he first arrived in the United States. “In Taiwan, I am the oldest grandson on both sides of the family, so I have more responsibilities and benefits than the other grandchildren. However, in the United States, I’m just alone,” said Tseng. “I am nobody in the United States because nobody knows me, and I don’t have any friends here.” During the fall 2017 semester when Tseng was on campus, he made friends and began to adapt to American habits. He acknowledged that this experience would help him in the future. 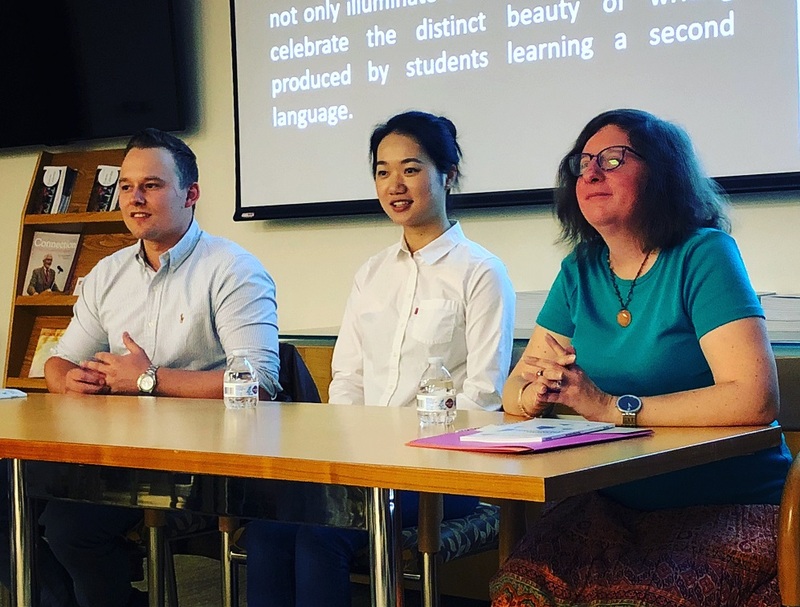 ELI students featured in book, Joakim Olsen (Norway), Yuan Cheng (China), and Amy Walker, ELI instructor, talk to the audience. In partnership with Syracuse University Libraries, the English Language Institute hosted a book launch in September at Bird Library. Copies of the book are available for purchase on Amazon.